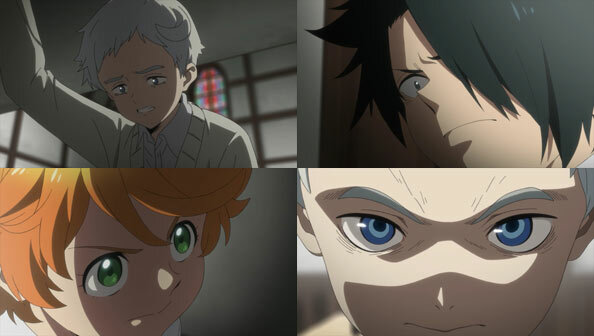 By the end of last week, four episodes of The Promised Neverland remained for the kids to escape the farm and survive the aftermath of casting aside their old lives, and all the protections and amenities therein. Even if their lives wouldn’t last much longer than if they’d stayed put, at least they’d die free. Alas, for all of the kids’ careful preparation up to this point, the situation has never been more dire. Any hope of Emma escaping on her own two feet has been dashed thanks to Mama’s act of appalling brutality (“clean break” indeed) while Norman is due to be shipped out in a day’s time. Norman puts on a brave face for Emma, but when he fetches water he betrays a look of paralyzing fear and despair. And yet, once that moment has passed, there’s a decidedly defiant look on his face, like he’s decided and committed to his next move. When he returns, Ray is with Emma, and they’ve already decided something as well. 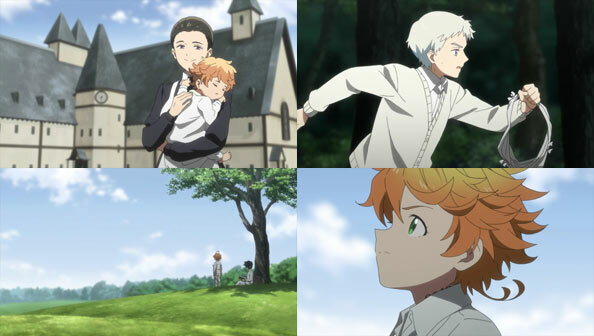 When Norman proposes they proceed with the escape plan without him once he’s gone and Emma is healed, they reject him in unison. Their counter-proposal: Norman will deactivate his tracker with the device Ray has just completed (using parts from all the various discreet rewards he got over the years), and hide out until Emma heals. Then they’ll all escape together. Norman is fine with this plan, except for the fact that if he goes missing, they may ship Ray out in his stead. In that case, Ray says he’s willing to have his arm broken so, like Emma, he won’t be suitable for shipping. 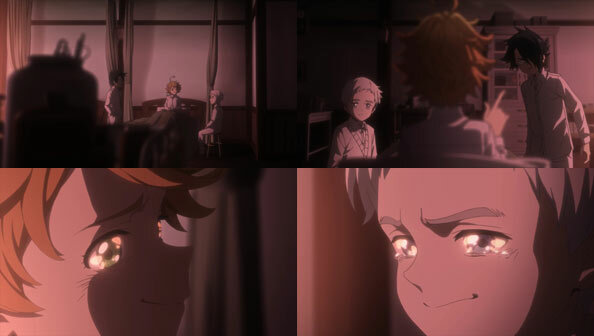 When Norman asks how Ray found out about the truth of the House, he says he’s always known, since he has memories of his life going back to when he was still in the womb. Norman agrees to the plan, and the next morning, Norman executes his escape, running to the wall with the backup rope Don and Gilda made, while Emma and Ray stick close to Mama. 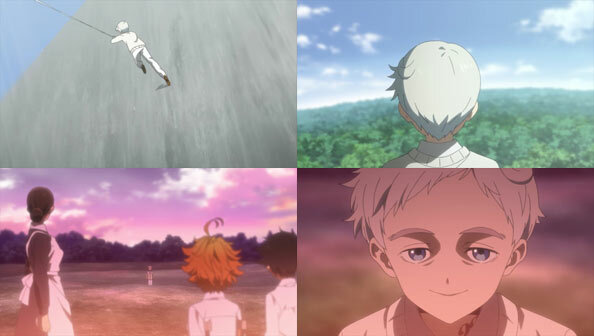 The music that plays while Norman is running to freedom is epic, hopeful and triumphant. After he attaches the rope, he holds it taut as he runs up the wall, and manages to grab hold of the top ledge and hoist himself up. A vast forest unfolds in all directions on the other side; a forest full of possibility. If they could get everyone into that forest, the adults would be hard-pressed to find them. When Mama finally notices Norman is not around, she checks his tracking device, and her expression makes it clear it’s not working. But to Emma and Ray’s horror, she smiles and closes the device, and Norman emerges from the forest, looking like he’d just been drugged or hypnotized. Turns out it was neither, but simply the look of utter, complete defeat. 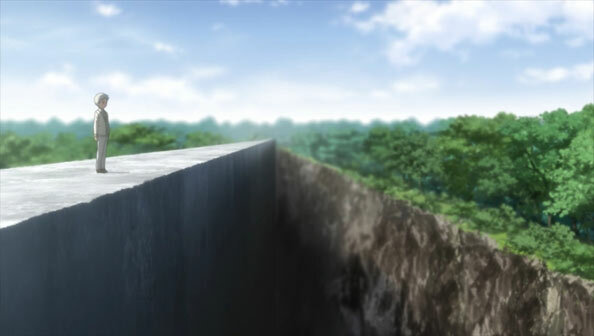 Only while atop the wall and looking over the other side could he discover the truth: there is a vast, yawning, sheer CLIFF between the wall and the forested land, of a distance they can’t hope to surmount. Just when the kids’ spirits were at their highest, everything is cruelly snatched away, and their doom feels more inescapable than ever. What an emotional roller coaster; a symphony sorrow; a triptych of tribulation. Those poor damn kids…what are they going to do now?